Criteria Labs has developed high performance self biased GaAs RF amplifiers to meet stringent reliability and quality requirements for space applications that are assembled, screened and qualified to MIL-PRF-38535 Class Q & V specifications. This lineup of gain blocks are available from DC to 12 GHz (L thru X band) and packaged in a small foot print hermetic, space qualified package. 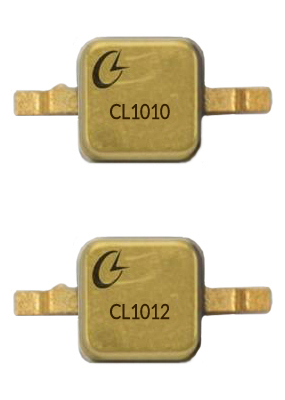 With noise figures below 1.0 db in microwave frequencies, our Indium Gallium Phosphide heterojunction bipolar trasistors (InGaP HBT) and pseudomorphic high electron mobility transistors (E-pHEMT) gain blocks are have been designed for highly sensitive SATCOM and radar applications and are built for survivability rated RF/Microwave military and aerospace radio designs. Additional features include self biased configurations that eliminating external bias controls and reduces support components.